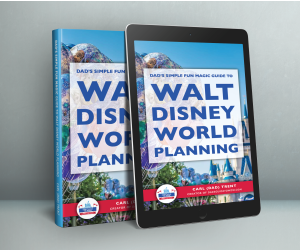 Just like people have their own unique personalities, so does every resort at Walt Disney World. Each Disney resort has its own unique theme that can be seen in its distinctive design, style, and décor. One of my favorite things to do at Disney is to take a day off from the parks and go exploring at the resorts, and its even more fun to do at the holidays because you get to see how each of the resorts translates their own unique style in their holiday decorations and Christmas trees. So let’s sleep in today, enjoy a big breakfast, and join me as we go on a tour of the Christmas trees of WDW! First on our stop is Disney’s Grand Floridian Resort. The Grand Floridian is the grand dame of resorts, and is easily the most elegant. So its only fitting that this resort would feature a five-story tall tree, one of the properties nine giant trees, draped in shimmering white lights and ornaments that look like they were taken straight out of the Victorian age! The minute you walk into the lobby this tree cannot help but command your attention! It is truly a sight to see and definitely one of my favorites. If the grand old world style of the Victorian era isn’t really for you, then maybe the vibrant tropical decorations of the Polynesian will be more your style. Don’t think that just because the Polynesian Resort lacks the large Christmas tree of the Grand Floridian, that their decorations are not worth stopping by to see. The Polynesian typically features lavish smaller trees with vibrant tropical color schemes. If some place tropical is your idea of the perfect holiday getaway be sure to make a stop at the Polynesian this holiday season. Now its time to say ‘Aloha’ to our tropical Christmas and take a ride on the monorail for a stop at the instead of using an actual tree, the Contemporary has decided to take the holiday tradition of gingerbread to a whole other level, by using it make their Christmas tree! Of course the resort still has smaller traditional Christmas trees through the lobby, as well as a giant tree out front. Traditional Christmas trees are great and all, but come on a giant gingerbread Christmas tree, I don’t see how that can be beat! While I do think that there is nothing cooler than a gingerbread Christmas tree and I do love the charming elegance of the tree at the Grand Floridian, I must admit that my favorite Christmas tree at the Disney Resort is the four story tall tree at Wilderness Lodge. I don’t know if it’s the rustic lodge feel of the resort, the roaring fireplace, or the tree beautifully covered in lights and Native-American themed decorations, but there is just something that feels so distinctly Christmas whenever I walk into the Wilderness Lodge. Next up lets head over to Yacht Club resort. There you’ll find decorations with distinctive nautical vibe, with a Christmas tree festooned with model ships and antique navigational instruments. And over at the Beach Club resort you’ll see trees decorated with tropical fishes, seahorses, and sea turtles. From the Beach Club we head over to the Boardwalk resort that offers trees decked out in turn-of-the-century old-fashioned Christmas decorations. 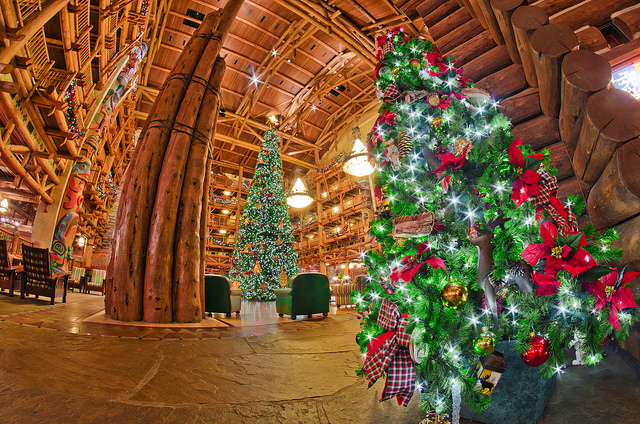 From old-fashioned Christmas to animal print decorations, our next stop on the tour is Disney’s Animal Kingdom Lodge. The holiday decorations at the Animal Kingdom Lodge are not to be missed! In its lobby you will find a giant tree adorned with African-inspired items such as animal shapes and prints, as well as rustic nature-inspired ornaments. This tree is breath taking and it is definitely worth a trek over to Animal Kingdom Lodge to see it in person. The Christmas trees of the Port Orleans Riverside and French Quarter resorts are pure Mardi gras magic! Here the trees feature the traditional Mardi gras colors as well as of purple, green, and gold, as well as plenty of Fleur de Lys Ornaments. The tree at Coronado Springs offers a rustic Southwestern charm. The tree is decked out in red and gold lights and ornaments, as well as plenty of poinsettias, with a hand carved wooden angle at the top. The Art of Animation resort went against tradition and features a white Christmas tree to offset the very colorful ornaments that decorate it. While the All-Star resorts keep their decorations pretty on par with their theming, sports decorations at All-Star Sports, film reels at All-Star Movies, and music notes All-Star music that doesn’t make them any less magical. The holidays always seem to make Disney World seem even more magical than it already was, and in turn Disney World always seems to make the holidays and holiday decorations seem more magical. Putting up the Christmas tree is always one of my favorite parts of the holidays. It’s one of the few times of the year and that my family stops what they are doing and just enjoys being doing something together for a few hours. At my parents house our tree always seemed bigger than big, and now that I live by myself, I have a little tiny tree no bigger than 3 feet tall. But, just like at Disney it doesn’t matter if it’s the grandest five-story tall tree or a modest tree decked out with film reels, they are all still special and magical, and unique in their own ways. I hope you enjoyed this tour of the Christmas trees of the Walt Disney World Resorts, and I hope it inspired you to do a little resort exploring this holiday season while visiting Disney. If you’d like to see more Christmas at WDW, check out last months WDW Magazine.